Haha, I’m laughing because it’s often what I’m telling my clients and sharing on this blog, and yet, I wonder how many people actually understand what that means? In other words, what does listening to your body actually look like? What are you actually doing? 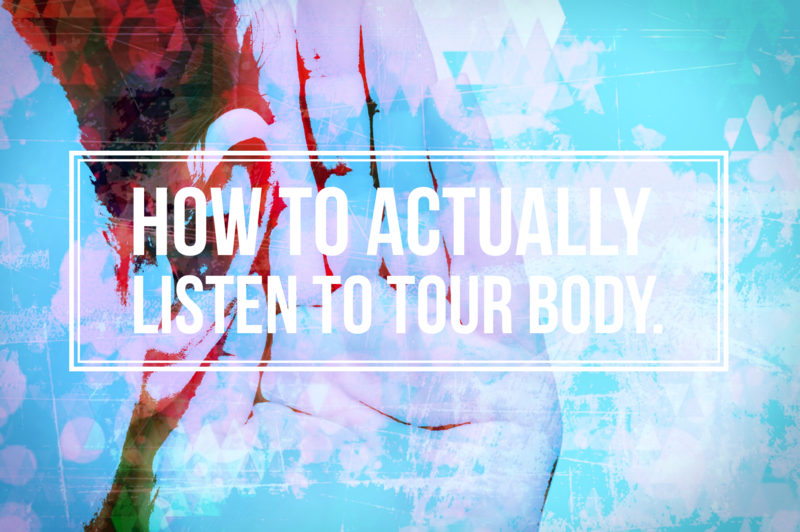 How exactly do you listen to your body? It sounds a little cryptic, right? Well, if you’ve ever wondered, awesome! Because I’m writing to share one of the easiest and quickest tactics I use to listen to my body, to listen to the messages it’s trying to tell me. To be completely transparent, I was inspired to share this with you today because I’m going through some major changes in my life and it feels like I’m falling apart at the seams- like a part of me is dying to create room for new growth and expansion. And since my body is very sensitive, s/he tends to express my emotions rather easily. As I was walking to my studio today, my entire lower to mid-back felt stiff, and when demonstrating exercises for my clients, my back felt like a 2×4 piece of wood – rigid and unbendable. So, after my sessions, I took some time alone. I closed my eyes and put my hands on the part of my back that felt stiff. I took 3 deep breaths in, focusing on breathing in and out of my back (in my case, the muscles called the erectors). 1. It felt like my back was working extra hard to try to hold me up. 2. I immediately envisioned a supporting beam of a house (hence why I said earlier that it felt like a 2×4). As soon as I felt and sensed these two things, I immediately made the connection: My back (erector muscles) were working extra hard to try to keep me from falling apart.Emotionally, I woke up feeling like my life was crumbling around me, and in an effort to make it through the day, and trying to hold it all together, my back was stepping up to provide the support. You see, whenever there is tension in the muscles, it is typically a sign that energy, especially emotional energy, is stuck. To release this stuck energy in my back I allowed myself to emotionally fall apart and cry openly as I walked down the street. I let go of my need to try to hold it all together. I also rubbed my hands down my back occasionally with a downward motion towards my feet to aid in moving this energy out of my back and into the earth. Now, I can’t say that my back is entirely supple like a wet noodle, but it is significantly better and less stiff since I’m no longer trying to hold it all together emotionally. I will do stretches later in the day to help too, as it is important to actually move your body to help release stuck energy along with emotionally releasing the energy as well. 1. Find a quiet space where you can have some privacy. A seperate room or even the bathroom if you’re at work. 2. Place one or both hands on the area of your body you are feeling pain/tension/aches. Close your eyes and focus on this area in your mind. Feel the connection your hand has with the skin of this area of your body. 3. Take 3-10 deep, slow breaths, focusing on breathing in and out of this area of your body. For instance, if your right shoulder is tight, place your left hand on it, and imagine that your breath is breathing in and out of this area. It sounds a little weird, but it works. Stay focused on this area, and notice what thoughts, images, feelings or sensations pop up for you. The trick here is to go with the very first thing that comes to mind. Even if it seems random, go with it, because chances are, it’s totally NOT random. For me, I immediately thought of a 2×4. It could be anything for you: a knot, a brick, a tight rubber band, rocks, cement, etc. If you feel tightness in the shoulder, maybe it feels like a tangled knot or like your bones are crammed up together. When I asked myself this question, “What is this 2×4 doing here?” I knew it was to support me. And knowing that I felt like I was emotionally falling apart, it made sense WHY my back was feeling stiff. It would make sense that I intuitively thought of a 2×4 piece of wood to help support me while I was emotionally feeling like I was falling apart. Using the shoulder example from above, if there is a knot there, ask, “What is this knot doing here?”. Perhaps the knot is there to keep your arms closer in towards your body, perhaps, because there is some fear in being exposed, open, or threatened. 6. Next, run your hands over this area of your body in a down and outward motion. For me, I ran my hands down my back towards the floor, like I was brushing myself off. Using the shoulder example, you would gently run your hand down and towards the tips of your fingers, like you’re dusting off dirt. 7. Finally, shake that limb or part of your body just a little to re-integrate it with the rest of your body. The shaking at the very end is a final release of any residual energy that may have been stirred up through this process. If you ever watch an animal in the wild break free from a predator, you may notice that it goes through a very brief period of shaking or twitching, This is an instinctive response called a “discharge” to help release the built up energy from a previously high adrenal state. BOOM. There you have it. A concrete and actionable process to actually listen to your body. Now, I will say that this is a skill that gets better with practice. And at first, don’t be discouraged if you have a hard time coming up answers to the questions. The more you pay attention and feel your body, the easier this will be for you. This is also a place for you to tap into that imagination of yours, and allow yourself to trust those immediate images, words or phrases that come up for you. If you are new to this whole energetic world, this is a solid place to start. Now, take a moment and notice where you might be feeling pain or tension in your body. And, I invite you, to try out this simple technique and let me know what you experience! And if you’re curious to learn more about this sort of stuff, and how you can become a Jedi master in healing your body, you may consider joining me next Wednesday April 6th @ 7 pm EST for a free virtual workshop where I’ll be teaching a process called “Body Mapping”. This is where I typically start with clients when introducing these energetic techniques to heal the body and relieve pain. Again, the workshop is totally free, and I’ll be recording the whole thing so if you’re worried about not making it live, you can still access the replay – however, I’ll only be sending it to those who enroll, so if you’re interested, please let me know by clicking here and adding your name and email address.